Raquel Panitz/Staff Photographer Junior forward Bobby Ahearn poured in 21 points to guide BU to an upset victory over Stony Brook. With just over four minutes remaining, junior forward Bobby Ahearn looked up with disappointment, then shook his head. What had been the Binghamton men’s basketball team’s 13-point lead floundered, then disappeared. Back-to-back 3-pointers from junior guard Bryan Sekunda gave the Seawolves (10-9, 5-1 America East) a three-point lead on Sunday afternoon. Reeling with frustration, Ahearn delivered a hard foul to Stony Brook junior guard Roland Nyama late in the second half. The subsequent free throws stretched Stony Brook’s lead to five. Late in the second half, the Bearcats (10-11, 1-5 AE) seemed to be marching toward another narrow loss. But instead of allowing the Seawolves to run away with the game, BU began to make shots. In the game’s closing minutes, BU and Stony Brook sparred for control. Trailing by just one point with 20 seconds remaining, sophomore guard Timmy Rose nailed a 3-pointer from the top of the arc to secure the Bearcats’ first conference victory, 71-67. Ahearn tallied 21 points, including four free throws and nine from beyond the arc. His offensive rebound off his own free-throw attempt led to Rose’s game-winning three. Senior guard Lucas Woodhouse led Stony Brook with 15 points and six rebounds, going 5-for-9 from the field. He was followed closely by redshirt sophomore guard Akwasi Yeboah, who tallied 14 points. Against Stony Brook, BU shot 49.1 percent from the field. The Seawolves hit 47.1 percent, including 42.3 percent from 3-point range. Junior guard Yosef Yacob played his first game at full strength since suffering a concussion last month. He sat out four of five games before playing eight minutes in BU’s loss to Albany last Thursday. With a 48.4 percent clip from beyond the arc, Yacob ranks second in the AE in 3-point field goal percentage. Going into its game against Binghamton, Stony Brook had won 22 of its last 24 AE games. The Bearcats’ win demonstrated a step forward after their early on in-conference play. 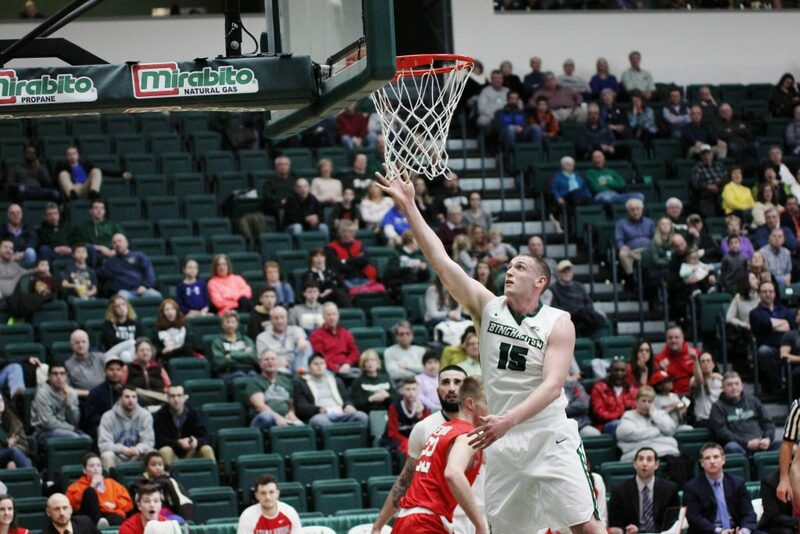 The victory also snapped Binghamton’s 14-game losing streak against Stony Brook. This was Binghamton’s first victory over the Seawolves with Dempsey at the helm. Binghamton is set to continue conference play against Hartford on Wednesday. Tipoff is set for 7 p.m. from the Events Center in Vestal, New York.